Hands on with Kwikset Convert: Replace the interior bolt, keep the exterior key lock. 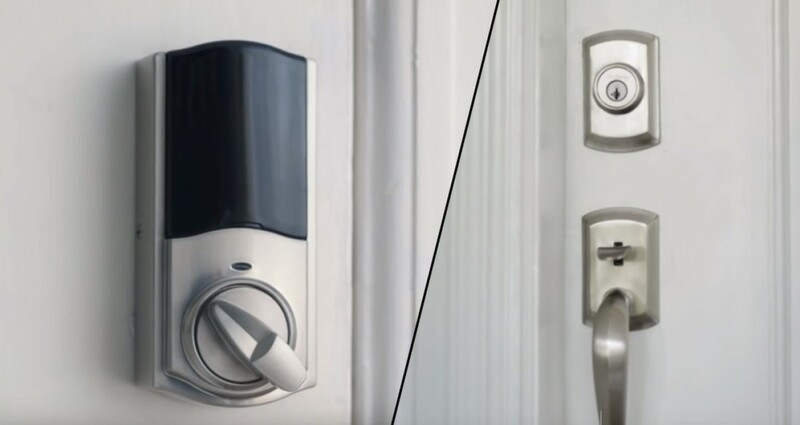 Kwikset and other major door-lock brands have built plenty of smart locks that replace traditional mechanical units, but in many situations you don't want to chuck the existing hardware. In apartment units, for example, you'll have to keep the existing deadbolt lock to provide access to property owners. Now Kwikset has a model, called Kwikset Convert, that can add automation features to locks that cannot be externally modified. It installs and operates similarly to August and other retrofit-friendly smart locks, but offers the Kwikset aesthetic and Z-Wave automation. The Kwikset Convert conversion kit is an interior box and mechanical apparatus that controls your existing deadbolt. The box is sleekly designed with a black plastic cover hiding the four AA batteries as well as some controls used in the setup. The rest is a metal lock to manually lock/unlock your deadbolt. The metal comes in two colors, Venetian bronze (dark) and the one we tested, satin nickel. While the design is nice, the interior box is fairly large to contain the lock components and batteries. It measures 9.87 X 3.49 inches and is 3.99 inches deep, meaning it sticks out substantially from the interior side of the door. Overall, this is a well-constructed product that, while by no means ugly, certainly does stand out. The conversion mechanism, the pieces that interact directly with the deadbolt components, are compatible with 1 3/8- or 1 3/4-inch-thick doors. The lock comes with three conversion kits from which you choose depending on the shape of your lock’s torque blade. The conversion kit is a simple adapter that sits over the torque blade and then connects to the interior lock of the Kwikset box. The conversion kit is light on features. 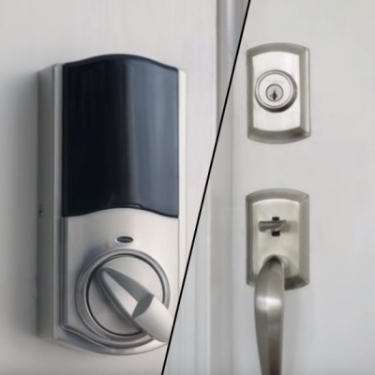 The lock can be set (by means of a DIP switch) to automatically relock the door 30 seconds after unlocking and has an indicator light that blinks every six seconds to let you know if the deadbolt is in lock position or not. Additionally, there are a few other buttons used to connect to your network during setup. To lock or unlock the door from the outside you can still use your original key, and from the inside there is still a mechanical lock that you can use as you would have before. The real magic of the Kwikset Convert is that it includes Z-Wave technology for wireless integration into home or small business automation systems. This allows the locks to be remotely locked/unlocked via a home automation controller either through preset parameters such as time of day, and/or alarm conditions detected by the home system, or through the use of remote software or smartphone apps. Pairing the lock with a SmartThings hub was a painless procedure taking only a few minutes, and bench testing with a Qolsys IQ Panel 2 was just as straightforward. Time-pressed integrators tasked with retrofitting a large number of locks will appreciate the ease in integrating an existing lock into a home automation setup; for me, it was by far the most appealing part of this kit and I have not been disappointed. The included “Installation and User Guide” was straightforward and provides a good amount of detail. All that is needed to install the conversion kit is a Phillips head screwdriver. The key step involved is identifying which conversion kit to use. Some images of the different torque blades and which kit they correspond to are included in the installation guide but since there are only three options, trial and error makes things even easier for the first door; after that, you know what to do. To begin you need to remove the interior portion of the existing lock, fit the adapter onto the lock’s torque blade and then install the mounting plate. The mounting plate will screw into the existing screw holes; after that all that’s needed is to attach the box containing the lock mechanism and battery case as well as its outer cover to the mounting kit via four screws. The only challenge came with getting all the screw holes to align properly. My test setup had an older door, and everything did not fit together smoothly on my first attempt. Still all it took was a bit of elbow grease to get everything together. This is not uncommon with lock installation, and the Kwikset Convert was no different in that regard from other locks we have tested. All in all, the instructions are clear and well-illustrated, making the installation process a minor project. Adding the Kwikset Convert to an existing lock is fairly straightforward. Remove the interior portion of the existing deadbolt (left), determine the conversion kit needed (center) and replace the old thumbturn with the new Convert (right). My primary concern with this lock is what if the deadbolt failed to lock fully into the strike? I tested this in an older apartment complex where the doors have had their share of warping and sagging and even when manually locking the door, some effort to align the lock and strike was sometimes needed. This misalignment can cause difficulty in fully extending the bolt or retracting it without pushing or pulling on the door. My fear was in attempting to lock the door via a smartphone on the way out the door and having it fail without noticing. Happily, after several months of testing this has been much less of a problem than anticipated. When the bolt was blocked from being fully extended into the locked position, an internal clutch slipped to prevent damage to the locking mechanism and a second attempt was automatically made. When that failed, the motor turned off and a steady tone was emitted, warning the user that the door was not locked. Additionally, the SmartThings app provides a status of the lock so that you will know whether or not it was successful. Even with an old, warped door, the lock failing to lock/unlock without aligning the door only occurred a handful of times over several months of daily use. Even when that happened, it was impossible not to notice and quickly correct the issue. The Z-Wave features proved extremely reliable as well. I programmed the lock to automatically lock each night at 10 p.m. as well as whenever my fiancée and I were both out of the house, based on our GPS location. Both of these features worked flawlessly and added an upgraded level of convenience to a home/small business automation system. No more employees forgetting to lock up at night, or not having access because the key person was late. After a few months of use, the Kwikset Convert smart lock conversion kit has proven to be a defining feature of an automation system. Since no changes are required to the outside of the door and the existing key is maintained, it can be installed without violating any office building or apartment complex rules. All told, I couldn’t be more satisfied with the product and how much more convenient it has made our lives. For residential applications, it is also a great feeling to personalize an apartment and make it feel a bit homier. Products are tested and reviewed by R. Grossman and Associates Inc., an independent consulting firm specializing in electronic security products and projects. 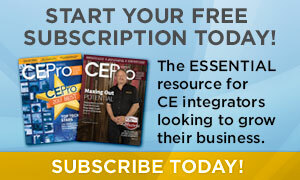 For more information, visit www.tech-answers.com.